The Native American Longhouse (NAL) Eena Haws represents the Indigenous people of the Americas and Pacific Islands. We strive to deconstruct colonial borders’ impact on Indigenous identities while also honoring the sovereignty of tribes. While protecting and preserving the rights of Indigenous people, we provide a sense of home/community for Indigenous students that helps preserve their Indigenous identities while in college. The NAL provides a source of support honoring the cultures of the first people of these lands. We also provide educational opportunities to educate all about the region's' tribes. The NAL prides itself in being a brave space that Indigenous students can be in community and express their culture. 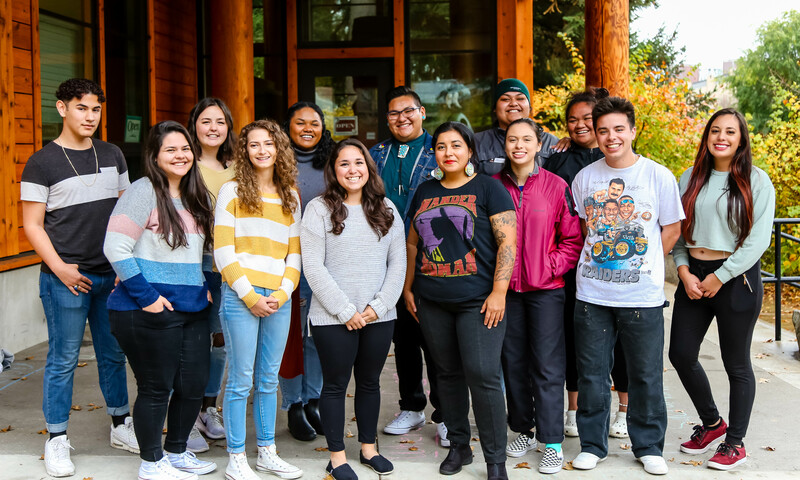 Events are held fall, winter, and spring terms that highlight Indigenous history, culture, and current issues that also help give the broader campus community more understanding about Indigenous people. We always recognize and give thanks to the Kalapuya people whose land OSU resides. If you would like to learn more about the space, we invite you to stop by anytime. You can also learn more about the NAL history in the Multicultural Archives in the Valley Library. We also invite you to follow us on social media and/or sign up for our listserv to be kept up to date with us. We welcome everyone to join us – even from a distance. If you would like to be connected to our resources from afar, please let us know, and we will work to include you in our efforts. The Native American Longhouse (NAL) Eena Haws has a unique history not only to Oregon State University (OSU), but also to the state. The NAL was created out of collective activist efforts of the Native students and the Black Student Union at OSU during the late 1960's. in 1971, the NAL was established and became the first cultural resource center at OSU. It was also the first Native center on a college campus in the whole state of Oregon. In 1972 the NAL was housed in a WWII Quonset hut on the corner of SW 26th Street and Jefferson Way in the heart of campus. In this way, the NAL Eena Haws paved the way for the development of the rest of the other six cultural resource centers at OSU, as well as other Native centers in the state. The NAL has evolved to what it stands for today through its historical significance at OSU. Through the capital campaign efforts of President Ed Ray, the current building the NAL resides in opened its doors winter term 2013. The NAL also officially added “Eena Haws” to its name, which means Beaver House in chinuk wawa. The NAL remains in the heart of campus and has an honoring circle surrounded by Oregon native plants where the old Quonset hut once stood to recognize and respect the history of the NAL as well as the blessing elders placed on the land. Our space and resources we offer are open to all students, faculty, staff, and OSU community.